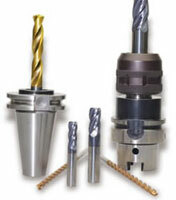 CLEVELAND, OH (March 27, 2006) – The George Whalley Company Coolant-Fed Tooling & Systems® Division introduces the Hurricane™ High-Performance End Mill. This new end mill is the only solid carbide, coolant-fed variable helix end mill available today. The Hurricane™ is manufactured with four unique, individual, coolant-fed flutes which provide a synchronized cutting action that eliminates chatter and vibration while providing unmatched stock removal rates. This state-of-the-art design allows for simultaneous roughing and finishing which produces a superior surface finish. The Hurricane™ also operates at higher feeds and speeds which increase production. The Hurricane™ End Mill is finished in a proprietary, 6 coat finish which improves lubricity. This high-performance end mill is available with either a corner radius or square end. The Hurricane™ is currently supplied with diameters ranging from 1/4” to 3/4” and overall lengths from 2-1/2” to 4”. The Hurricane™ High-Performance End Mill provides maximum performance when machining stainless steels, cast iron, high temperature alloys, low carbon steels as well as tool and die steels. The George Whalley Company Coolant-Fed Tooling & Systems® Division (www.coolantfedtooling.com), based in Cleveland, Ohio, maintains the largest inventory of coolant-fed tooling and accessories available today. Their comprehensive range of coolant-fed standards and specials include drills, reamers and cutters, end mills, taps, spade blades and holders, toolholders, sealing devices, pumps and more. The George Whalley Company Coolant-Fed Tooling & Systems® Division’s products are available from cutting tool distributors throughout the United States and Canada.